I am writing this blog to describe routing(Navigation) of SAPUI5. Please see my GitHub repository “YoheiFukuhara/sapui5-routing” for further detail. My sample program works like this. There are 2 routing from “View From” to “View To”. One is without parameter and the other one is with parameter. View are quite simple so I don’t explain anything. Routing is configured by “manifest.json” under “webapp” folder. TargetViewToParameter: Navigation from “ViewFrom” to “ViewTo” with parameter. “patern” shows parameter id to be passed. The Navigation is implemented using Router function. Passed parameter value with “TargetViewToParameter” is fixed value “test” here. With this routing method, we can go to the view with parameter directly. In my case, url is as follows. 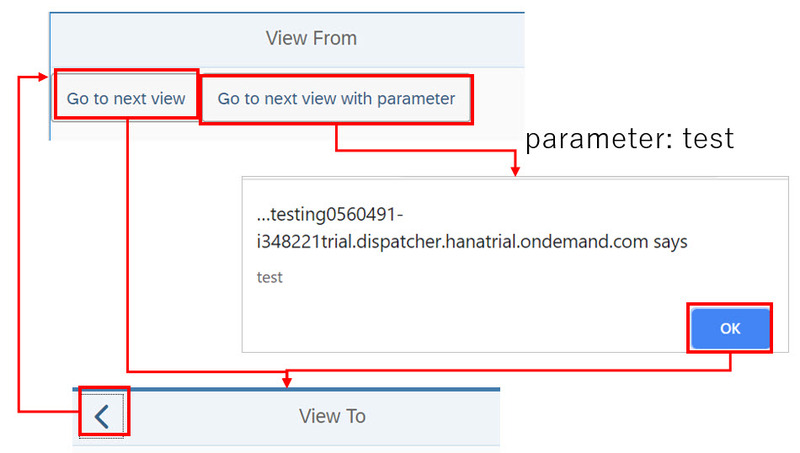 “RouteViewTo” part is routing pattern name and add parameter as “test” here.